T25-1.5DCTH4 is a AC direct systems consist of a turbine-generator unit producing AC power which is used as needed. That is, it is fed directly to the appliances. No need of battery and inverter, T25-1.5DCTH4 offers a complete water to wire system with integral turgo turbine, generator and valve flow control. Designed to deliver ready-to-use 115V/230V VAC power, it employs a brushless, special rare-earth permanent magnet alternator and therefore has a higher efficiency than ordinary alternator. Output voltage and frequency are controlled by the electronic load controller(with ballast). As little as 14 to 18 liter per second (l/s) falling 15 meter through a pipe can supply enough power to comfortably run a small household. This machine is compact, easy to install and requires little maintenance except lubricating the bearing every few months. The turgo turbine was designed for families in remote areas to produce power for their households easily and inexpensively. These units have been incredibly successful and today thousands are installed throughout the world. Water is collected upstream from the turbine and channeled in a pipe down to the turbine location. 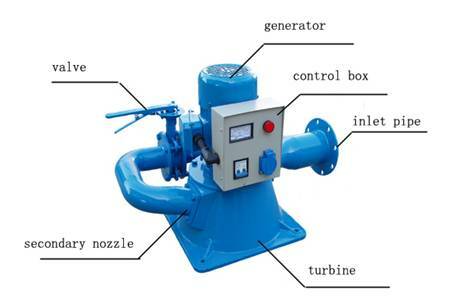 At the turbine, the water passes through 2 nozzles, where it accelerates, strike the turbine runner, and turn a AC single-phase brushless permanent magnet alternator. A electric load controller is built on the alternator which stabilizes the voltage to 110V or 220V to protect electrical appliances during use. Installation is very simple and explained in the manual. Once installed there are no running costs and maintenance costs are very low. 1. The volume of water flowing in your stream, expressed as liters per second. 2. The head (height of drop) of the falling water, expressed in meters. 3. 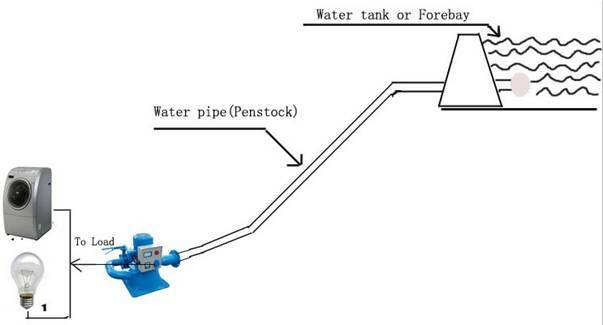 The length of the penstock (pipeline) in meters.